jDivision of Neurosurgery (J.G.M. ), Children's Hospital Los Angeles, Los Angeles, CaliforniakDepartment of Neurological Surgery (J.G.M. ), Keck School of Medicine, University of Southern California, Los Angeles, California. SUMMARY: This article provides an overview of phase-contrast and time–spatial labeling inversion pulse MR imaging techniques to assess CSF movement in the CNS under normal and pathophysiologic situations. Phase-contrast can quantitatively measure stroke volume in selected regions, notably the aqueduct of Sylvius, synchronized to the heartbeat. Judicious fine-tuning of the technique is needed to achieve maximal temporal resolution, and it has limited visualization of CSF motion in many CNS regions. Phase-contrast is frequently used to evaluate those patients with suspected normal pressure hydrocephalus and a Chiari I malformation. Correlation with successful treatment outcome has been problematic. Time–spatial labeling inversion pulse, with a high signal-to-noise ratio, assesses linear and turbulent motion of CSF anywhere in the CNS. Time–spatial labeling inversion pulse can qualitatively visualize whether CSF flows between 2 compartments and determine whether there is flow through the aqueduct of Sylvius or a new surgically created stoma. Cine images reveal CSF linear and turbulent flow patterns. Rapid advances in imaging techniques have remarkably improved the diagnosis and treatment of CNS disorders, with MR imaging being the most recent. New MR imaging applications are continually being developed, providing improved assessment of CNS disorders and their response to treatment. One area that has received much attention, but with only limited success, is CSF movement, the alteration of which results in many clinical disorders with hydrocephalus (including normal pressure hydrocephalus), cystic CSF collections, and Chiari malformations being more common. Until now, the only MR imaging technique to visualize CSF movement is phase-contrast (PC) MR imaging. Time–spatial labeling inversion pulse (Time-SLIP) is another option, which makes it possible to noninvasively select CSF at any region in the CNS and visualize its movement for up to 5 seconds, providing information about CSF dynamics even in slow-flowing regions. Time-SLIP is expected to have widespread application for diagnosis and evaluation of response to treatment of abnormal CSF movement. 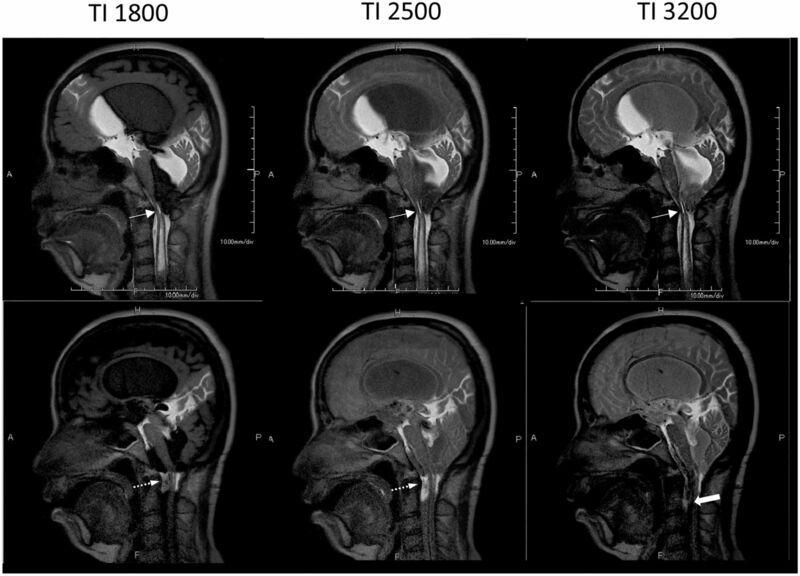 The objective of this article is to review the history and findings of PC and discuss additional benefits of Time-SLIP as another technique for expanding the role of MR imaging for the care and management of CNS disorders. In PC, signal contrast between flowing and stationary spins is generated by sensitizing the phase of the transverse magnetization to the velocity of the spins.8,9 PC collects 2 datasets, each with opposite polarity. When the 2 datasets are subtracted, accumulated phases from stationary spins cancel, but because flowing spins move from 1 position in the magnetic field gradient to another during the time between the executions of the 2 opposite polarity gradients, the moving spins accumulate a net phase proportional to the velocity of the nuclei. Because velocity is being measured as phase, the velocity values must be within +π and −π. Aliasing occurs if a phase value is >π, causing the phase to wrap back to a multiple of π. A parameter was developed that sets the maximum velocity that can be encoded in the pulse sequence, known as the velocity-encoding value (Venc). The Venc can be adjusted according to the arrangement of the bipolar gradients. PC generates the best results when maximum flow velocity is anticipated correctly through the Venc. Flow velocities greater than the Venc produce aliasing artifacts, and velocities much smaller than the Venc result in poor image quality and weak signal.10,11 An example of aliasing artifacts is shown in Fig 1. When aliasing occurs, the velocity information must be corrected by adding or subtracting 2 × π × Venc during postprocessing, or the scan can be repeated with a higher Venc. Magnitude and phase images are generated from 1 acquisition containing both anatomy and velocity information. A 26-year-old healthy male volunteer. A, Geometry for the oblique-axial CSF phase-contrast scan. The section is positioned axially at a 90° angle through the aqueduct of Sylvius (rectangle, A). Aliasing (B) occurs if a phase value is greater than the maximum expected velocity, causing the phase to wrap back to a multiple of π, appearing black (black arrow) when it should appear white (or vice versa). Uncorrected (dotted line) and corrected (solid line) flow waveforms in milliliters per second represent bidirectional flow through the aqueduct (C). Aliasing can be corrected off-line by adding a multiple of 2 × π × Venc to aliased pixels. By synchronizing the acquisition with the cardiac cycle, the series of images generated contains velocity information that can be mapped to the phases of the heartbeat. From this, velocity can be plotted as a function of the cardiac cycle, providing the ability to calculate stroke volume, flow rate, mean velocity, and peak systolic/diastolic flow. 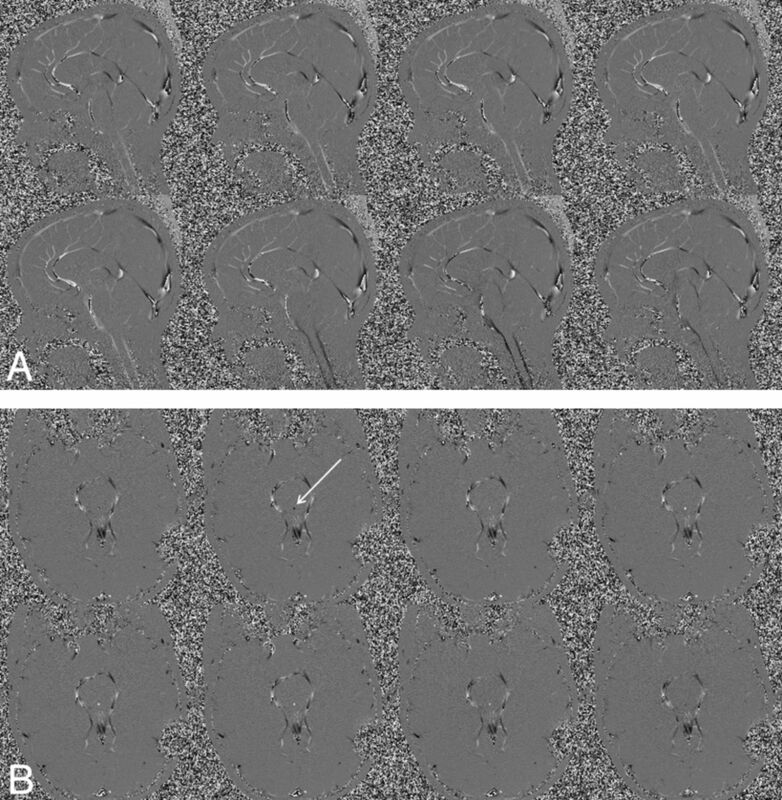 Two series of velocity images are shown in Fig 2, where Fig 2A depicts a series of midline sagittal images and Fig 2B depicts a series of axial images at the level of the aqueduct. In both series, every odd phase of the 16 cardiac phases that were acquired is displayed. An 18-year-old healthy female volunteer. A, A series of midline sagittal images depicting pulsatile CSF flow, where flow magnitude and direction are represented as gray-scale. Flow changes from positive to negative and back to positive (white indicates peak caudal flow; black, peak cranial flow). B, Depiction of a series of axial images at the level of the aqueduct (arrow). In both series, every odd phase of the 16 cardiac phases that were acquired is displayed. The SNR in PC images is highly related to the precision between the Venc and the velocity being measured. Choosing the Venc very close to the maximum expected velocity results in the maximum SNR in the velocity image. The Venc must be lowered to achieve sufficient SNR for slow CSF flow. A setting of a Venc that is too low may cause aliasing. Lowering the Venc increases the gradient strength on the bipolar gradient and may increase the TR. Imaging flow throughout the cardiac cycle requires a short TR to achieve adequate temporal resolution. Therefore, PC for optimal CSF flow results requires careful fine-tuning of parameters for maximizing temporal resolution, SNR, and Venc. This sometimes can be problematic for patients whose CSF flow velocities are very high or very low compared with control values, with no way to individually predetermine the optimal situation. PC can only measure CSF if it is moving. One limitation of the measurements obtained from PC acquisitions is that they result from data collected over a large number of cardiac cycles. The final velocity waveform represents an average measurement of those cycles, but it is presented as 1 cycle. For the most accurate quantitative evaluation of CSF flow, through-plane acquisition is performed perpendicular to the aqueduct, which minimizes partial volume effects.10,11 Qualitative assessment of CSF flow can be accomplished with a midline sagittal acquisition for assessing in-plane flow. Not accounted for is the effect of respiration. In addition to net flow measurements, some studies have used the time-dependent features of the waveform to identify abnormal pathophysiology. One such study revealed a shorter systolic flow period of the temporal waveform for patients with communicating hydrocephalus compared with healthy controls.12 PC measurements of CSF flow have also been used to study patients with Chiari I malformation. In these studies, the CSF flow at the craniocervical junction has been shown to exhibit changes in flow patterns, including local flow jets and bidirectional flow.25⇓–27 These studies have shown that patients with Chiari I malformations have significant elevations of peak CSF systolic velocity at the foramen magnum. The application of these findings to determine which patients would benefit from a craniocervical decompression has, however, proved problematic. Prediction of improved clinical function following CSF diversion, particularly in patients thought to have NPH, has been a highly sought goal for PC CSF flow studies. In particular, the association between aqueductal stroke volume and the response to shunting has been tested numerous times.19,21⇓⇓–24,30,31 Initial studies found a positive response to CSF diversion for patients with NPH whose aqueductal stroke volumes reached ≥42 μL.19 However, repeat studies by Kahlon et al32 performed in 38 patients did not find any statistical significance between stroke volume and improvement from shunting. Dixon et al22 also failed to find an association between CSF pulsatility and clinical symptoms of NPH. Some of the variability in findings may be attributed to temporal changes that naturally occur, with PC measuring 1 point in time of a dynamically changing system. 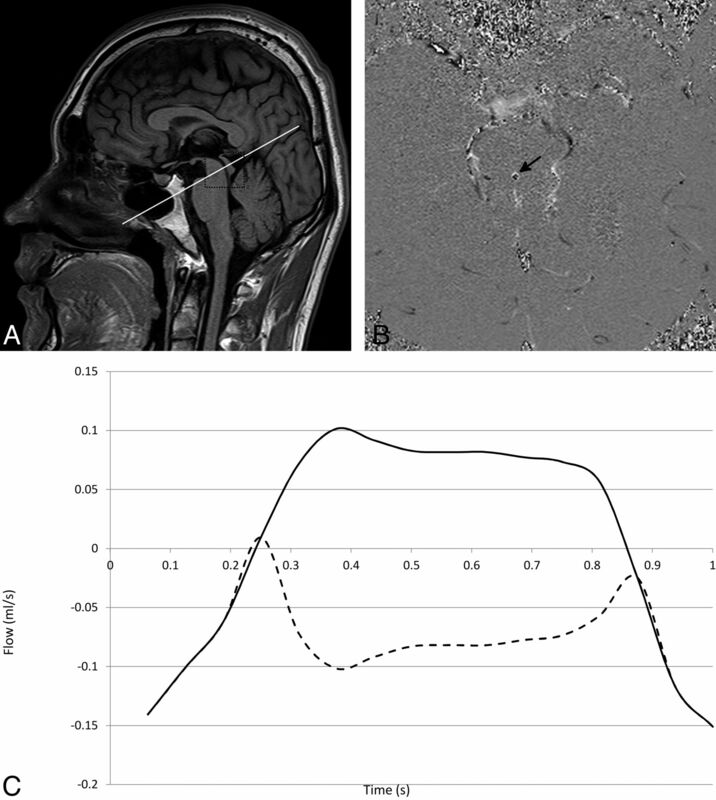 In fact, Scollato et al33 observed a patient with unshunted hydrocephalus for 2 years and found an initial increase in aqueductal stroke volume, followed by a decrease. Therefore, this variability in pulsatility, which is still not clearly understood, makes it difficult to use a single PC measurement of stroke volume as a reliable predictor of whether a given patient will respond favorably to CSF diversion. A New Look at CSF Movement. Historic CSF flow theories of progressive hydrocephalus propose that blockage of the arachnoid granulations increases the resistance to the absorption of CSF into the bloodstream, leading to an accumulation of CSF in the ventricles. In the pulsatile models of hydrocephalus, a “water-hammer” effect is hypothesized, in which large undampened pulsations produce increased pressure gradients and asymmetric pulsation distributions lead to ventricular dilation.34,35 Enlarged pulse-wave amplitudes of CSF movement in patients with NPH have been observed and measured with MR imaging for a number of years.1,36 This effort has attempted to improve our understanding of hydrocephalus.14,15,36 However, it has failed to correctly identify those patients who would benefit from CSF diversion. PC cannot reliably visualize CSF flow within the ventricular or subarachnoid spaces or within cysts; this visualization can be repeatedly accomplished with Time-SLIP.37 Bulk CSF flow (ie, drainage of CSF from the CNS) of approximately 20 mL/h, is too little and too widely dispersed to be seen with MR imaging at present. Time-SLIP is an arterial spin-labeling variant that can be combined with fast advanced spin-echo or steady-state free precession sequences to depict flow in any imaging orientation within a targeted region.37,38 For vascular imaging, arterial spin-labeling magnetically tags the blood with radio frequency pulses and uses the labeled blood as a tracer to generate vascular images in a relatively simple manner. The stationary tissue signal is suppressed by an inversion pulse, and the final image contains only the contribution of the labeled flow, acquired after a deliberate delay time known by convention as the TI interval. Arterial spin-labeling has been used to evaluate blood flow in the renal, carotid, and pulmonary arteries and in the pulmonary and portal-venous systems. This technique produces high-quality angiograms by using blood as its own tracer, instead of a contrast agent.39⇓⇓⇓⇓–44 The application of arterial spin-labeling lends itself very well to imaging CSF movement, by using CSF as its own tracer as well. CSF movement viewed with Time-SLIP uses a single-shot fast advanced spin-echo technique as the underlying sequence in any sagittal, coronal, axial, or oblique plane. Technical details can be found in the article by Yamada et al.37 While the use of arterial spin-labeling for visualization of the vasculature throughout the body is well-established, its application for CSF flow imaging is relatively new and differs from traditional applications in its use of incremental TI within the same 2D imaging sequence, thus enabling the CSF and its movement to be viewed in small incremental steps, independent of the cardiac cycle. On the basis of the results of initial baseline studies, Time-SLIP can be readily used as a screening tool to determine whether the CSF flow is typical, atypical, or not moving at all.37 In an article by Yamada et al,37 2 patients with hydrocephalus did not exhibit the same reflux pattern consistently depicted in the healthy subjects. In a patient with noncommunicating hydrocephalus secondary to a posterior fossa tumor, the reflux flow into the lateral ventricle was absent from the tagged CSF in the third ventricle. A repeat study in this patient following the placement of a right lateral ventricle external CSF drain showed re-establishment of the normal reflux flow pattern consistently observed in the healthy subjects. In a patient with a left middle fossa arachnoid cyst, the CSF in the basal cistern was tagged. Before fenestration, no evidence of CSF flow into the cyst was noted. After surgical intervention, a repeat study demonstrated labeled CSF flowing into the cyst. In both cases, imaging with Time-SLIP confirmed noninvasively the anticipated restoration of CSF movement. 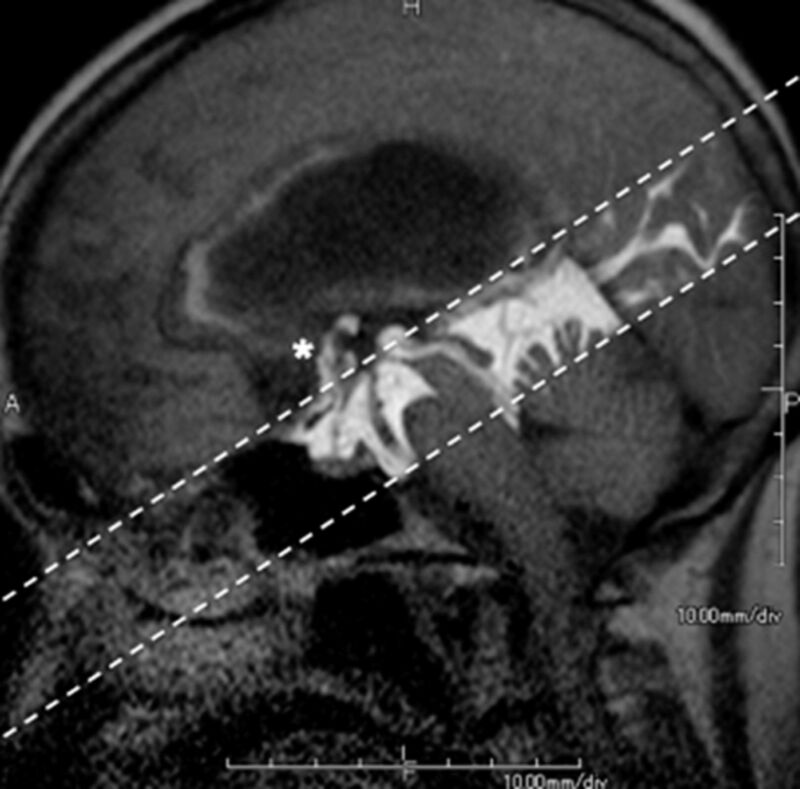 A recent case study reported the usefulness of Time-SLIP in evaluating a patient with an enlarging symptomatic cavum septi pellucidi (CSP), a CSF-filled cavity bounded by thin triangular vertical membranes separating the right and left anterior horns of the lateral ventricles.47 Serial CT scans noted progressive enlargement of the CSP and lateral ventricles in this patient, who developed progressive headaches and obtundation following a subarachnoid hemorrhage. Before surgical intervention, Time-SLIP showed CSF flow between the third and lateral ventricles, but not into the CSP. 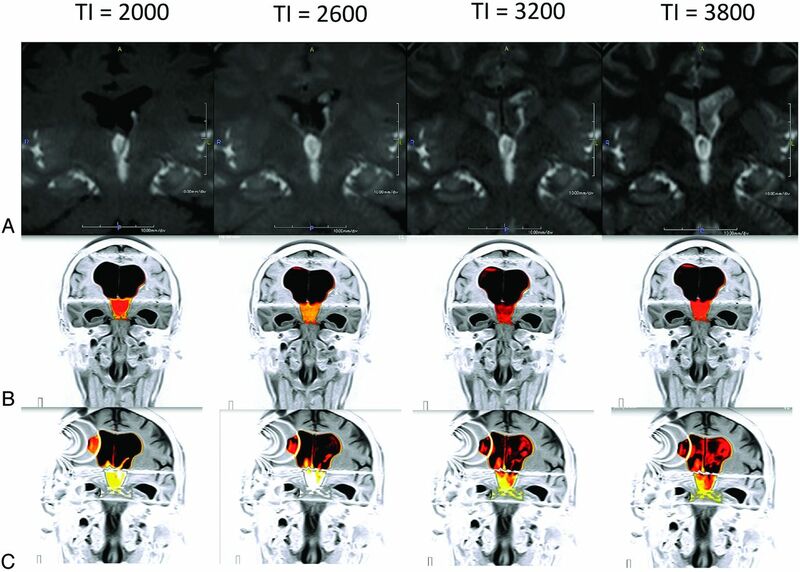 Following surgical fenestration of the CSP, MR imaging with Time-SLIP demonstrated decreased ventricular and CSP size and the presence of CSF flowing between the third ventricle and the CSP, which coincided with resolution of this patient's symptoms. The Time-SLIP study in this patient supported the hypothesis of Shaw and Alvord48 that in asymptomatic nonexpanding CSP, CSF is in free communication with the ventricular system. In fact, the study showed that when CSF communication was absent in this patient, the CSP expanded.48 The case study is an example of the clinical usefulness of the technique in demonstrating the presence or absence of CSF communication. The effect of respiration on CSF flow has not been adequately studied with PC because of temporal limitations. Low-resolution or indirect methods such as echo-planar imaging and real-time acquisition and evaluation of pulsatile blood flow have not been able to adequately visualize CSF movement in response to respirations either.49 The higher intrinsic SNR and temporal resolution of Time-SLIP make it possible to visualize CSF movement in response to respiration and how the CSF flow patterns are altered by the depth of the respiratory effort. Time-SLIP is a straightforward noninvasive method for determining whether CSF can flow between 2 spaces and whether flow has been restored after surgical intervention.37,47 Because Time-SLIP acquires a series of images during several seconds, the presence or absence of CSF movement from the tagged region into adjacent compartments, such as through the aqueduct of Sylvius, confirms the presence of CSF flow or blockage, as seen in the patient depicted in Fig 3, before and after endoscopic third ventriculostomy. Time-SLIP can be used postoperatively to evaluate the patency of the fenestration by observing CSF flow between the third ventricle and the basal cisterns (Fig 3). Reflux flow from the third ventricle into the lateral ventricle has been established in adult patients without hydrocephalus; however, flow has been shown to be restricted in patients with hydrocephalus and NPH.37 Normal reflux flow in a healthy patient is seen in Fig 4A, restricted in NPH (Fig 4B), and restored after surgical intervention (Fig 4C). A Chiari malformation can restrict normal CSF flow between the cranial and spinal compartments; this restriction, in turn, results in CSF accumulation within the spinal cord, producing a syrinx. Time-SLIP is a useful, noninvasive tool for evaluating pre- and postoperative craniocervical decompressive changes to CSF flow (Fig 5). For understanding CSF flow disorders, the PC technique to quantify CSF flow velocities and Time-SLIP to visualize CSF flow characteristics, pathways, and blockages are qualitatively useful techniques in combination. Time-SLIP is especially useful in regions where it is difficult or impossible to visualize CSF flow with PC, such as in the lateral ventricles, subarachnoid spaces, or within a cyst, secondary to limitations of Venc, SNR, or the absence of pulsatile flow. The Time-SLIP tag is freely selectable, and its orientation is easily and infinitely changed to target the region of interest, allowing CSF flow to be visualized in any direction or location. Half of all occurrences of NPH have no known cause, and diagnosis is made primarily by clinical observations such as gait disturbances, dementia, and incontinence. Although enlarged ventricles are the expected MR imaging finding in patients with suspected NPH, the definitive diagnosis of NPH is difficult, and PC has not consistently predicted patient responsiveness to shunting. More extensive studies are currently underway to investigate whether Time-SLIP will be more predictive in diagnosing suspected NPH that is responsive to CSF diversion. PC was the first quantitative MR imaging tool for evaluating CSF in pathophysiologic conditions. Time-SLIP provides additional information about CSF flow patterns. Perhaps most remarkably, the typical CSF flow pathway that has been described in textbooks is actually much different from that observed noninvasively with Time-SLIP,45 even in the normal, nonhydrocephalic brain. Larger clinical studies are expected to provide additional evidence. Possible clinical applications using Time-SLIP to visualize and monitor CSF movement are listed in the On-line Appendix. Disclosures: Shinya Yamada—UNRELATED: Grants/Grants Pending: $5000,* Payment for Lectures (including service on Speakers Bureaus): $2000, Travel or Meeting Expenses Unrelated to Activities Listed: $2000, all from Toshiba Medical Systems. Kazuhiro Tsuchiya—UNRELATED: Payment for Lectures (including service on Speakers Bureaus): Development of Educational Presentations: Toshiba Medical Systems. Mark L. Winkler—RELATED: Other: travel support to meetings from Toshiba Medical Systems; UNRELATED: Consultancy: Toshiba America Medical Systems. *Money paid to the institution.